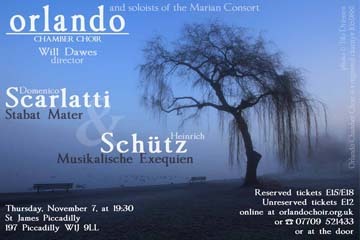 Orlando Chamber Choir joins forces with singers from The Marian Consort and three outstanding accompanists. The concert programme includes Schütz' double-choir setting of the Magnificat in a German translation by Luther, and the large-scale Musikalische Exequien for choir and soloists, written for a German prince's funeral. Schütz managed to combine the prescribed texts into a "burial mass", including paraphrases of Kyrie and Gloria. The final highlight is Scarlatti's Stabat Mater in which ten individual choir parts cradled by a small instrumental complement create a highly personal atmosphere of compassion and tenderness.